Nha Trang is a coastal city in Khanh Hoa province, Vietnam. It is considered as one of the oldest coastal city with the most developing tourism service in Vietnam. If you have the opportunity to travel to Nha Trang, you will easily be "knocked out" by the charm and dynamism of this beautiful city. This is an ideal destination for those who both want to enjoy the beaches and relax in luxurious resorts. However, have you ever known how to have a “worthy trip”? Here, we will share with you some wonderful tips so that you can have a memorable holiday. You can travel to Nha Trang by motorbike, coach, train, or airplane. However, depending on your departure, you should choose suitable means. If you choose to visit Nha Trang by plane, you will arrive at Cam Ranh Airport, and you will go to the city center from there. Ho Chi Minh City to Nha Trang: trip’s duration is from 8 hours to 10 hours. 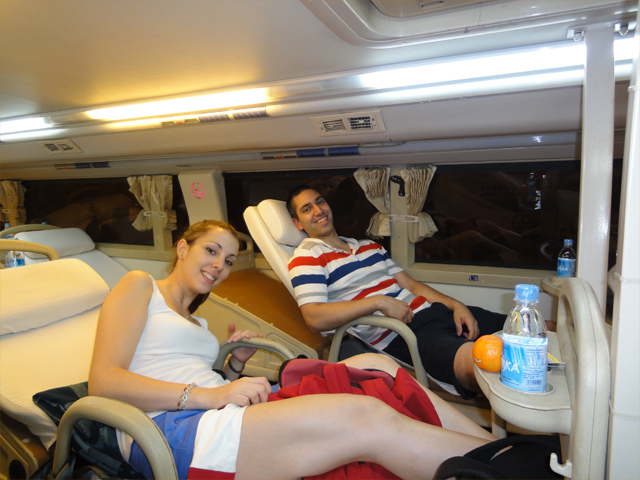 • Hanoi to Nha Trang: trip’s duration is about 30 hours and 48 minutes. Address: No. 7 Lane 155 Cau Giay Street, Quan Hoa Ward, Cau Giay District, Hanoi. You can contact the nearest station for details about ticket prices, departure time, etc. 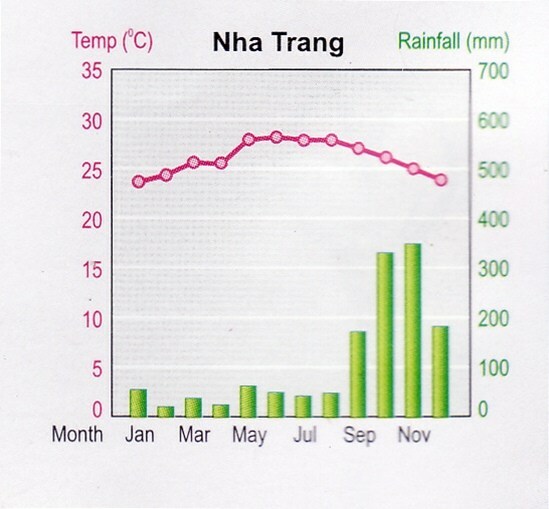 Nha Trang has pretty mild climate with two distinctive seasons: the rain season and the dry season. According to Nha Trang tourism experience of "predecessors," you can come here at any time of year. - Suitable time: It's best to go to Nha Trang in the period from January to August. But Nha Trang is the most beautiful in July, August, and September or in December and November of the Lunar Calendar. - Unsuitable time: October and November are the time you should not go to Nha Trang, because your plans may be ruined by heavy rains. 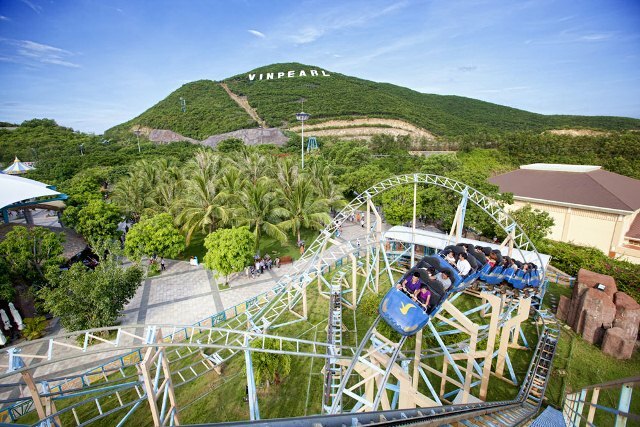 Located on Hon Tre Island with crystal-like water all year round, Vinpearl Land is known as the "tropical paradise". Besides the luxurious hotel, beautiful gardens, ideal freshwater pool, this place also attracts visitors with Thrilling game parks, aquariums, and spectacular 4D cinema. 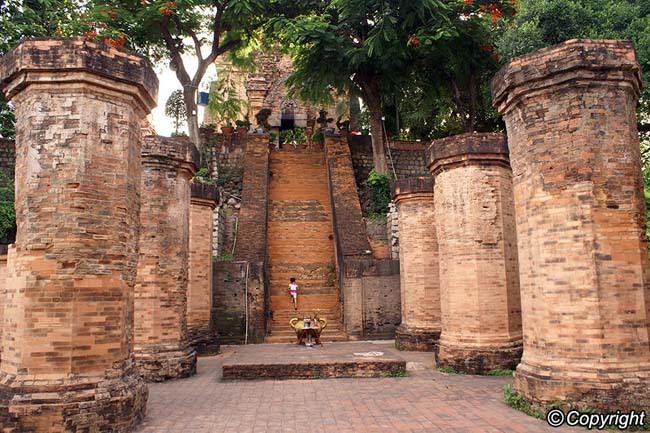 Ponagar Temple, which is the relics of Champa architect that has the most valuable value of the central region of Vietnam, is considered as the symbol of Nha Trang. This Temple opens to visitors from 6:00 AM to 17:30 PM. After visiting the Temple Ponagar, you can combine mud-bathing package at Thap Ba hot springs resort nearby. The ticket fee is approximately 150,000 VND (about 6.57 USD) for each person. This is considered as a specialty of Nha Trang so you should not miss this experience. You must not forget to bring swimwear on entering this area because according to the rules here, you must wear a swimsuit to be allowed to get in. However, you can purchase for the swimsuits at the resorts, but it is not recommended because they are quite expensive and may not well fit you. Oceanographic Institute, which was established in 1923, is located at No. 1, Stone Bridge, about 6 kilometers to the southeast from the city center of Nha Trang. There are over 20,000 specimens of 4,000 types of marine and freshwater organisms, which were collected and preserved for years. 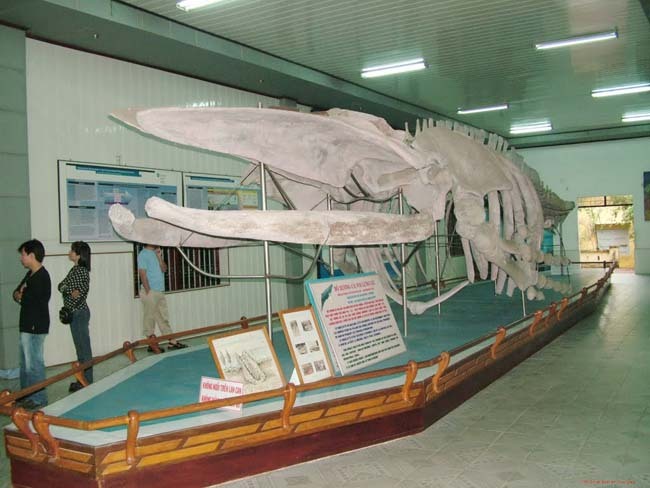 Especially, on coming to the Institute of Oceanography, you will surely be impressed by the giant whale skeleton, which is about 26 meters in length, 3 meters in height and the fully restored 48 vertebrae. This is actually a must-not-miss destination for families with children or young people, who love to learn about animals. 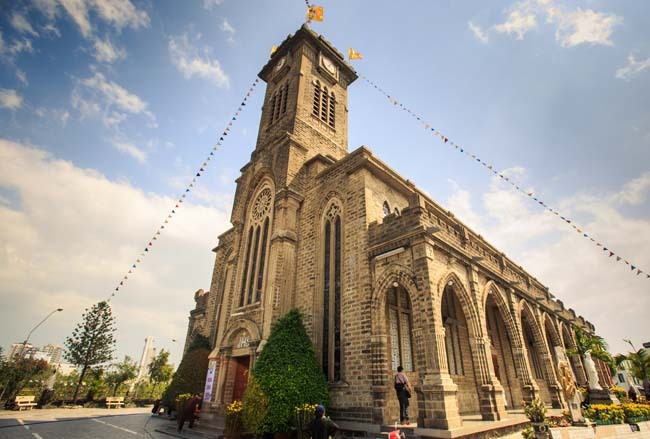 Stone Church, also known as Nha Tho Nui, Nga Sau Cathedral, Nha Trang Cathedral, is built in 3/09/1928 and completed in 05/1933. This is a unique Catholic work of the French, built by Father Louis Vallet, which is located on Hoang Lan Hill. With the total height is 12 meters, this Stone Church attracts many tourists and photographers come here every year. It is a pity if you traveling to Nha Trang without taking part in a tour to islands. 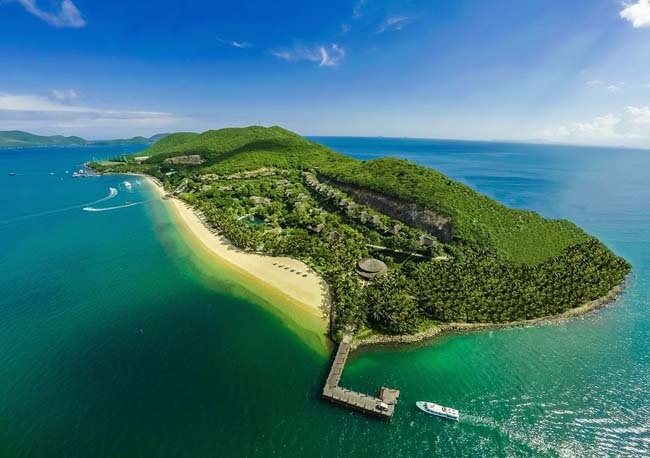 Because Nha Trang has many beautiful islands, which worth contemplating, and those islands may be the natural works but can also be man-made. Such islands as Hon Tam and Hon Mun or Con Se Tre, Tri Nguyen Aquarium, etc. are also famous sight-seeing. You should buy the tour that includes traveling to four islands; there are many choices about the stopping point, which can last for 5 hours, depending on the activity. 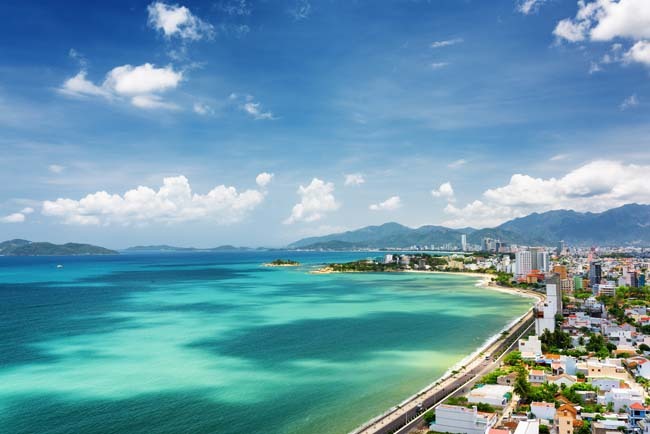 On traveling to Nha Trang, tourists will be certainly impressed by the food stalls selling seafood, Spicy Vietnamese Noodle Soup, Vietnamese Mini-pancake, Vietnamese grilled pork sausage, etc. Traveling to Nha Trang without enjoying the seafood is a pity. Being a precious gift of Mother Nature, Nha Trang’s seafood is extremely fresh and diverse in comparison to other regions. Hoa Bien Restaurant, located at the north of Tran Phu Bridge intersection. A Thanh – grilled fish restaurant, 33 Trinh Phong Street. Restaurants located at the north of Tran Phu Bridge, especially, those are near Thap Ba Street and Bo Ke with the famous snail dishes. 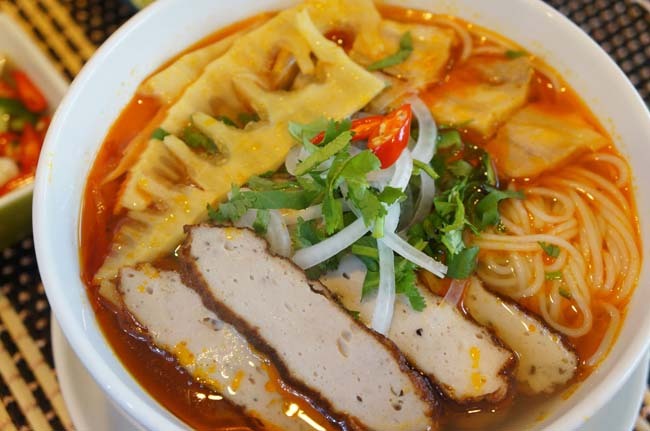 Fish cake noodles soup, which is a famous dish of the coastal city of Nha Trang, is simply cooked with pure broth, fish cakes, and vermicelli. Delicious and famous fish cakes are made from fresh fish to ensure its toughness. Those fish cakes are mainly made of mackerel, sardines, sailfish ... and are usually processed into two kinds steamed and fried fish cakes. Additionally, Jellyfishes noodles with jellyfishes as the main material, which are freshly caught at Nha Trang’s ocean. This dish tastes best with fish cakes, sea chubs, and sweet, pure broth. You can also eat jellyfish noodles with fresh vegetables, spicy and lemon. Thick noodles soup of Nha Trang has such a unique taste thanks to the broth cooked with tough but soft sea fishes, fish cakes. Additionally, Nha Trang thick noodles soup is usually served with sea chubs. 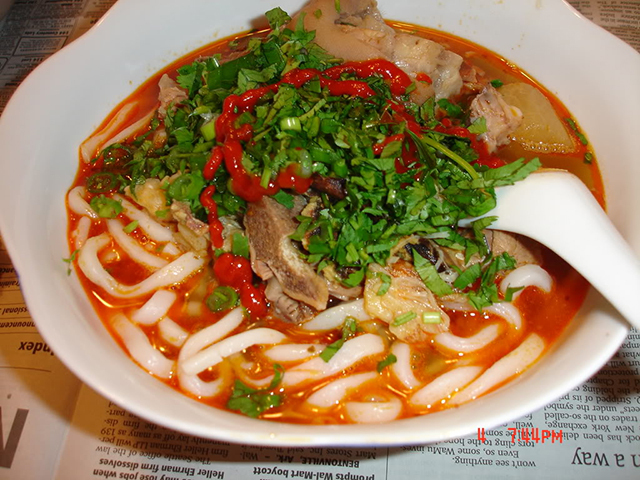 Eating a bowl of thick noodles soup with fish cakes along with tuna or mackerel, and a little bit of spicy fish sauce, you can feel all the coastal cuisine. The Thick Noodles Soup Restaurants located at Thong Nhat and Ba Trieu intersection. Vietnamese Grilled Pork Sausage is a must-eat dish when traveling to Nha Trang. 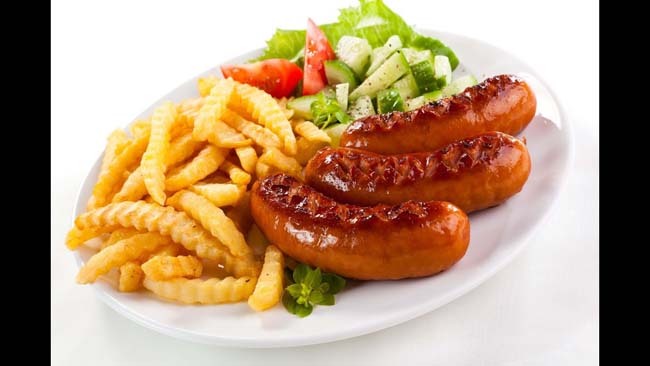 Grilled Pork Sausage originates from Ninh Hoa, but today it has become a popular must-eat dish in Nha Trang that all travelers always feel eager to try once. The main material for this dish is quite complex with grilled pork, deep fried rice paper and it is served with vegetables. Vegetables served with Grilled Pork Sausage include nearly a dozen kinds of taste as piquancy, sourness, and acridness. Depending on the vegetable season, they can be fish mint, garlic chives, basil, lettuce, cucumber, banana, star fruit or green mangoes; sometimes you can eat this dish with sour pickles or onions. Grilled Pork Sausage Restaurant, 25 Le Hong Phong Street. Dang Van Quyen Grilled Pork Sausage Restaurant, 16B, Lan Ong Street. Dang Van Quyen Grilled Pork Sausage Restaurant located at Phan Boi Chau and Han Thuyen intersection. Ngoc Tien Grilled Pork Sausage Restaurant, 59 Le Thanh Phuong Street. 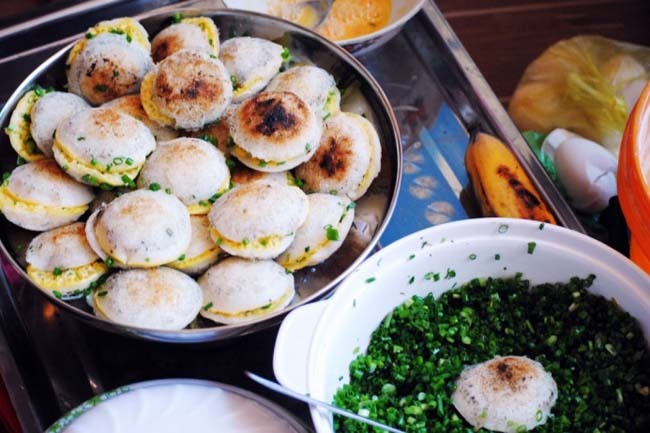 The shape of Nha Trang’s Mini-pancake (Banh Can) is similar to Southern one’s (also known as Banh Khot). The main material of this dish is rice. The rice is soaked, ground into flour and pour into a mold made of clay. The stuff of mini-pancakes is diverse with many types such as meat, eggs, mushrooms, squids, shrimp, etc. This dish tastes best with the special red sauce, which is quite viscous and quite sour, sweet, spicy and savory.